Welcome to another edition of our third annual TV Madness Tournament! 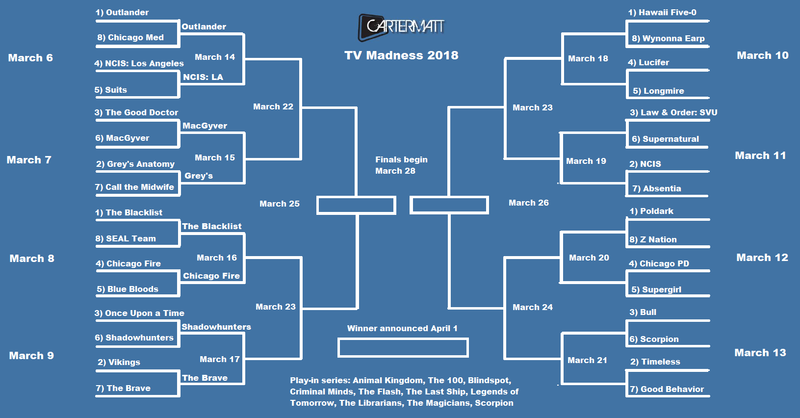 This is a fun annual tradition here at CarterMatt where we have some fun, engaging battles between various shows looking to make it all the way to the final round on March 28. Above, you can see our full bracket, complete with entries, their seeds, and start/end dates. Once you are within the bracket, the dates listed are when the previous poll ends and the next one begins! We’ve got a great group of shows taking part this year, with some newbies as well as others who have been a part of the tournament every single year. The voting rules are pretty simple — you can vote however often you would like on however many devices that you would like! If you are on mobile and you are having a problem seeing the poll at the bottom of the article for whatever reason, be sure to click to view the non-AMP version of the page at the bottom of the article. For this round 2 battle, we come presenting two shows in Shadowhunters and The Brave who each have that Cinderella feeling around them. They both pulled off arguably two of the largest upsets of all time within the first round and with that, there’s a hunger to keep it going. Could one of them become this year’s version of Black Sails, a low-seeded show that went on an epic run to the final four last year? That’s certainly possible and we’re excited to see what happens. Now that we’ve set the stage, let’s get to breaking down these entries further. Voting for this round remains open until Friday, March 23 at 1:00 p.m. Pacific time. Shadowhunters (#6 seed) – The first round was no guarantee for Shadowhunters as it had to face off against former finalist Once Upon a Time, a show that also is in its final season and could have seen a voting bum because of that. Yet, the Freeform drama and its fans did enough to pull off the upset here and allow it a chance to compete in the second round. With the premiere right around the corner, we have a feeling that Shadowhunters fans are more unified than ever. The Brave (#7 seed) – Yet, The Brave isn’t going to make this showdown easy. This is a show that had a very strong showing in round one against a series in Vikings that has finished in the top eight in the past; it’s also a show that needs strong campaigns behind it already because of its renewal status. This is one of the most unified, passionate fan bases you’re going to find in the tournament this year and that is in part what makes this underdog showdown so exciting. Vote for your favorite show in the poll below and be sure to also like CarterMatt on Facebook for some additional news on both Shadowhunters and The Brave.